Preheat the oven to 375º F. In a small bowl, whisk together the half-and-half, egg, and salt. 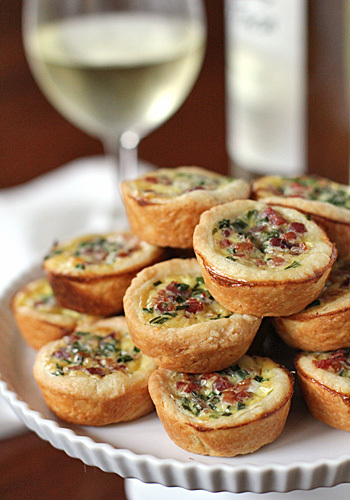 Evenly sprinkle the cooked pancetta into the pastry cups; top with 1 teaspoon of parmesan. Evenly drizzle half-and-half mixture over cheese and sprinkle with chives. Bake for 20-25 minutes or until puffed and golden brown. Carefully remove the tassies from the muffin pan and transfer to a wire rack to cool briefly. Serve warm with cayenne pepper to taste. Cooled leftovers can be stored in an airtight container in the refrigerator for up to 3 days. Reheat in a 350º F oven for 5-10 minutes or until warmed through.